Every employee is different. So how do you design an effective employee engagement strategy to increase performance & productivity? There are 7 key engagement drivers. The key is to first understand which ones motivate individual employees the most. Only then can you start to develop strategies and solutions to further engage the individual, and build a workforce that is motivated, productive and performing to its highest potential – but it all starts by working with the individual employee. We know that not all people leaders are coaches, mentors and psychologists. So it is the organisation’s responsibility to ensure the people leaders & managers they entrust with their talent capital have the skills, tools and resources to maximise their people’s engagement and motivation. The good news is 70-90% of engagement can be driven by the individuals themselves – but first they need help. Life by Design’s Employee Driven Productivity (EDP) approach is the missing link to effectively unlocking workforce potential and creating a self-responsible culture. Increase individual & team productivity. 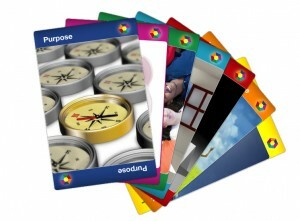 As an ideal suppliment to the ‘7 Engagement Driver Cards’ is our ‘People Glue – Employee Engagement’ online training for all leaders and managers, now available in our mobile friendly Self-Paced Learning eLearning Course.